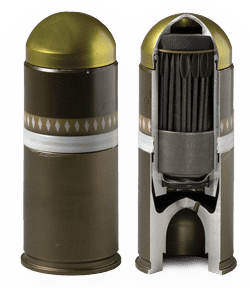 The 40mm M1001 High Velocity Cartridge Canister (HVCC), fired from the MK19 Grenade Launcher, allows the operator to radically change use of the MK19 from a stand-off area weapon to a short-range anti-personnel and perimeter defense weapon. The M1001 HVCC is designed for applications such as Perimeter Defense, Close Range Self Protection and Police and Security Actions. 96% Probability-of-Hit on E-type silhouette when firing a 3 round burst against personnel in a 14X14 foot target area at 100m. Produces a 3 to 4 foot wide dispersion pattern at 50m.